Heat butter in large skillet set over medium high heat. Sauté mushrooms, thyme, garlic, salt and pepper for 4 to 5 minutes or until mushrooms are golden brown. Sprinkle with flour. Cook, stirring for 1 minute. Stir in white wine and cook for 1 to 2 minutes or until most of the liquid has evaporated. Slowly, stir in chicken broth; bring to a boil. Stir in cream. Add chicken; simmer, stirring occasionally, for 8 to 10 minutes or until sauce is reduced and thick. Stir in parsley, green onion, and Parmesan cheese. Cool completely. Preheat oven to 425°F. Whisk egg with 1 tbsp water; set aside. Lightly dust clean work surface with flour. Place pastry on top and cut each sheet into 4 even squares. Place about 1/4 cup chicken and mushroom filling in the center of each square. Brush the outer edge with egg wash. Fold over pastry to make a turn over. Crimp the edges with a fork to seal the pastry. Brush the pastry with egg wash. Cut vent holes in the center of hand pie. Bake for 20 to 25 minutes or until golden brown. Serve with cranberry sauce and Green Salad. Whisk oil with vinegar, mustard, maple syrup and salt and pepper until combined. Toss spinach with radicchio, pear and vinaigrette. Stir in dried cranberries and pecans. 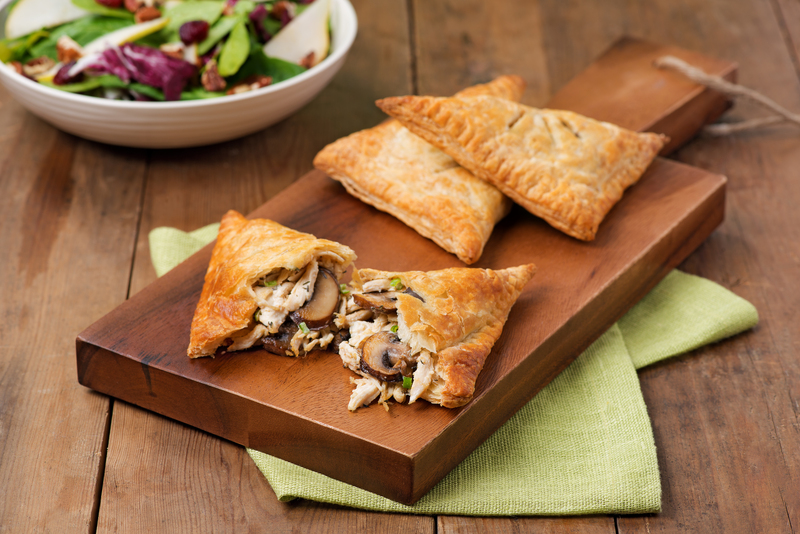 Freeze leftover chicken pies for a quick and easy meal any time.